This project supports staff who are trained in health coaching but are not providing it to patients on a regular basis. It also introduced an evaluation framework to continually assess the training and support needs of staff in South Eastern Sydney Local Health District (SESLHD). To increase the translation of health coaching training into everyday clinical practice, from 56 per cent to 75 per cent by April 2019. Empowers patients and improves their health outcomes and experience. Provides staff with ongoing training and support in health coaching. Helps staff understand what health coaching is and why it is used. Delivers a better return on training and development investment. Aligns clinical practice to the SESLHD Integrated Care Strategy 20151. An estimated 21 per cent of the SESLHD population has multiple morbidities, or more than one disease1. If not managed well, this has the potential to add pressure to the healthcare system and impact patient experience. SESLHD have defined health coaching as ‘a person-centred approach to goal-setting, active learning and self-management that guides, empowers and helps the individual connect to their own motivation to change their behaviour’. There is evidence to show that health coaching can improve self-management and health outcomes of patients, including physical function and quality of life2. Health coaching has also shown to reduce costs for the healthcare system and the consumer. Due to these benefits, health coaching is a key priority in the SESLHD Integrated Care Action Plan3. Since 2011, the SESLHD Integrated Care Unit has commissioned Health Change Australia to train over 750 staff, general practitioners and practice nurses in health coaching. However, prior to the project there was anecdotal evidence that suggested a disparity between the training provided and the techniques used in the clinical setting. This was confirmed in a survey conducted in June 2017, where results showed that 44 per cent of staff who had attended Health Change Australia training were not translating the knowledge and skills acquired during training into their clinical practice. This represented a significant number of missed opportunities to improve patient care and experience, staff experience and population health. workshops with staff and managers, focusing on issues and root causes. The barriers to translating knowledge and skills into practice were found to be: a lack of ongoing support and information resources; staff not feeling confident that their level of skills and knowledge were sufficient for implementation; and a misunderstanding about what health coaching is and how it can be used. Following consultation with staff and patients, the following four solutions were proposed. In 2017, the NSW Ministry of Health released a working definition of health coaching, which was explored and tested with the project steering committee, SESLHD staff and local experts in health coaching. Minor changes were made to capture the broad scope of health coaching and ensure it was technically correct. This definition will be circulated to health coaching training participants, and through district newsletters and resources developed for health professionals, managers and patients. Face-to-face support sessions were developed and implemented by the Organisational Development and Learning Unit. These incorporate a short review of health coaching techniques and focus on issues experienced by participants. Issues are discussed as a group and participants are given time to practise their skills in groups of three. After the workshop, the Integrated Care and Organisational Development and Learning Units continue to engage with the groups of three and facilitate opportunities to continue practicing health coaching skills in a safe environment, using valid and reliable feedback tools. Ongoing evaluation will determine the frequency of these sessions and how many support sessions are required for individuals. During the consultation phase, staff indicated the types of resources that would help them translate their training into clinical practice, including tools, templates, literature and frequently asked questions. These resources are currently in development in consultation with the Organisational Development and Learning Unit and will be tested by staff before they are published on a new ‘Centre for Coaching’ page within the SESLHD website in May 2018.
an annual evaluation of the status of health coaching within SESLHD, including staff and patient needs, the frequency and quality of health coaching provided and a snapshot of how normalised health coaching has become as a way of working. A full evaluation will be undertaken in April 2019, incorporating an annual coaching survey that will measure the translation of health coaching training into everyday clinical practice (target 75 per cent). Each of the four solutions will also be evaluated via surveys, workshops and focus groups. Make sure you understand the problem, by spending time on diagnostic activities. It is important to revise project goals and activities as new information becomes available during the diagnostic phase. The delivery of health coaching training is not enough to translate the knowledge into practice. Post-training support and resources are required to achieve culture change. In retrospect, a definition of health coaching needed to be developed earlier in the project, as the perceived definition and benefits varied among staff. Regular meetings along with supportive and active sponsors is essential to maintain project timelines. NSW Health. 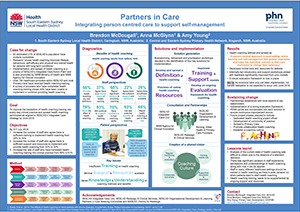 Integrated Care Strategy 2015. Kogarah, NSW: South Eastern Sydney Local Health District; 2015. Kivela K, Elo S, Kyngas H. The effects of health coaching on adult patients with chronic diseases: a systematic review. Patient Education Counselling 2014:97(2):147-57. NSW Health. Integrated Care Strategy Action Plan 2015-2018. Kogarah, NSW: South Eastern Sydney Local Health District; 2015.